People with certain conditions must limit their oxalate intake. Oxalate is a substance found in many plants. In the body, it can combine with calcium and form crystals that can contribute to kidney stones and gout. It also promotes inflammation, which aggravates inflammatory conditions such as rheumatoid arthritis. Both potatoes and sweet potatoes contain elevated oxalate levels. Check with your doctor to determine how much oxalate you are allowed to consume daily. Physicians recommend a restricted oxalate diet for patients with kidney problems or conditions that are sensitive to oxalate levels. A low-oxalate meal plan limits your dietary oxalate intake to about 50 milligrams or less per day. However, restrictions depend on your specific situation. Some people are allowed to consume a little more, while others are advised to eat less. The oxalate content of food varies greatly and is divided into groups considered low, moderate, high and very high. 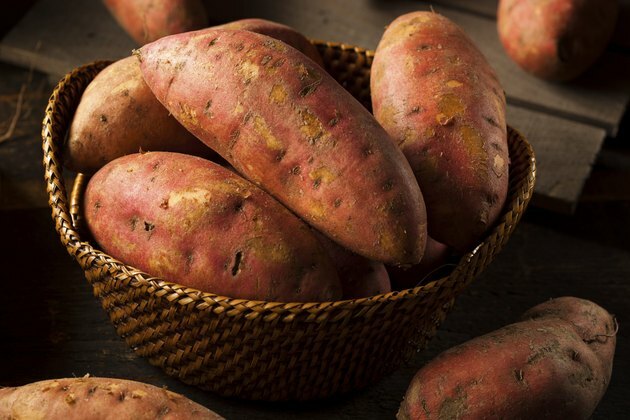 Although sweet potatoes are considered a nutritious food, they are categorized as very high in oxalates and unfit for a person on a low-oxalate diet. Foods that contain less than 2 milligrams of oxalate per serving are considered low, according to the University of Pittsburgh Medical Center. A 4-ounce serving of cooked sweet potatoes contains 141 milligrams of oxalate, according to the Children's Medical Center of Dayton. While potatoes are not nearly as high in oxalates as sweet potatoes, they are still considered a high-oxalate food. High oxalate foods are described as containing between 10 and 50 milligrams of oxalates per serving. A medium Idaho potato contains 64 milligrams of oxalate baked. A serving of half the potato contains about 32 milligrams of oxalates, according to Dayton Children's Medical Center. Avoid sweet potatoes if you are on a diet that restricts oxalates. Even a small serving of sweet potatoes contains more than the acceptable amount. Potatoes, on the other hand, might be allowed in very small servings depending on the amount of oxalates you are allowed per day. For example, a fourth of a potato contains about 16 milligrams of oxalate, which might be feasible as long as your other meals contained very low amounts. Check with your doctor to determine the type and amount of foods allowed for your condition.